(Newser) – The estranged wife of George Zimmerman said today she thinks her husband has unraveled since he was acquitted in the fatal shooting of Trayvon Martin. 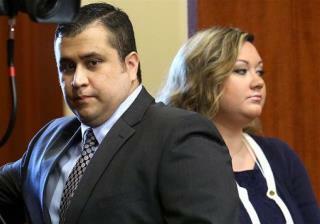 "I don't know who George is anymore," Shellie Zimmerman said on Katie Couric's show Katie. After his murder trial, he became unpredictable and "a pacing lion," she said. "I like to think I married a person who was a good person, and going through the past year and a half, I don't know how that changes a person, or how a person's spirit breaks, but it certainly seems that's what happened to him." This man is going to get himself in worse trouble if he does not get himself some counseling assistance. Just from his "brushes" with the law, he appears to be on the wrong path.